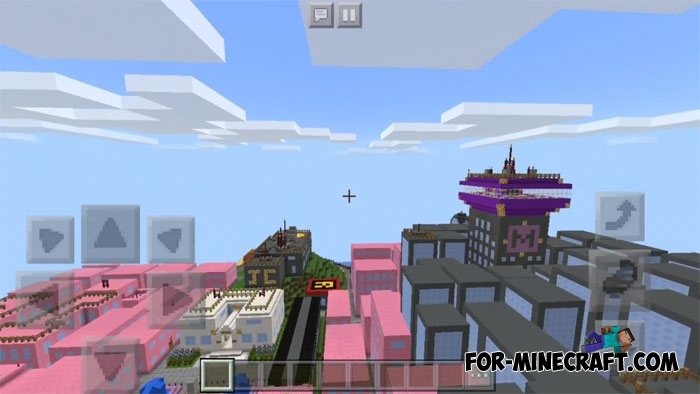 If before you could see a lot of completely different cities for MCPE which parody real capitals and large centers including monuments of architecture and skyscrapers, now map-makers started to build fantastic or cartoon cities and settlements. One of these cities is Jump City in which you can visit. Jump City is basically pink buildings, and generally pink color prevails over the rest. This city is the home of the main characters from the Teen Titans cartoon. Looking at the map you will see that the city consists of two parts between which a small river flows. It is important to note that this is not an exact copy and there are many differences that can not be recreated in Minecraft PE. Teen Titans mod (Minecraft PE 1.1)You can turn into any superhero of the popular cartoon Teen Titans right now. This mod adds 13 characters that.. Thanks for writing this article about my map!